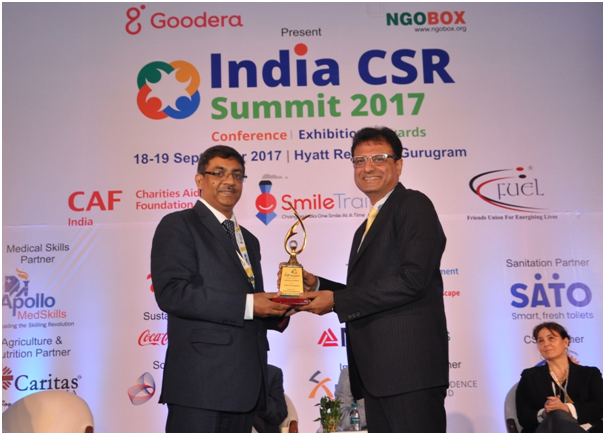 5th CSR Impact Awards - Hosted by NGOBOX and Powered by Dalmia Bharat Ltd. 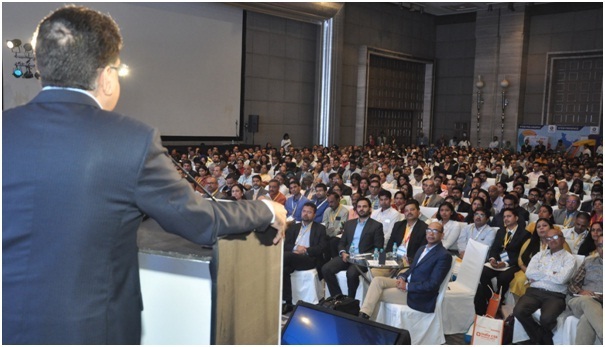 The Awards are presented in a gala ceremony during India CSR Summit & Exhibition every year. This year the event is being held at Hotel J W Marriott, Aerocity, New Delhi on 24th and 25th September 2018. The event information is available at www.indiacsrsummit.in . The 2018 Awards ceremony will be covered by one of the largest English news channels of India, CNN News 18, with telecast of a special episode on the channel. We have partnered with institutions and organizations of repute to take collaborative steps to recognize CSR projects with excellence in delivering through partnerships, persistence and project or programme-based approach. This is the fifth edition of our annual Awards. The previous four editions of the CSR Impact Awards (2014, 2015, 2016 and 2017) were highly appreciated by companies, implementing partners and CSR foundations. The 2014 awards received entries from 35 of the BSE top 100 companies in India including ITC, Maruti Suzuki India, DLF, Hindustan Coca Cola, ACC, Essar, Tech Mahindra, Wockhardt etc. while in 2015 there were 42 applications from a range of organizations including Reliance Foundations, Dr Reddy’s Foundations, HPCL Ltd, Intel, Grasim, Ultratech, Bosch Ltd, Lupin Foundation, JK Lakshmi, L&T Finance, Hindustan Zinc, Vedanta, ACC, PVR, Sterlite Tech, WNS Global, UPL Ltd, Cholamandalam, JK Tyre etc. This is the fifth edition of our annual Awards. The previous four editions of the CSR Impact Awards (2014, 2015, 2016 and 2017) were highly appreciated by companies, implementing partners and CSR foundations. The 2014 awards received entries from 35 of the BSE top 100 companies in India including ITC, Maruti Suzuki India, DLF, Hindustan Coca Cola, ACC, Essar, Tech Mahindra, Wockhardt etc. while in 2015 there were 42 applications from a range of organizations including Reliance Foundations, Dr Reddy’s Foundations, HPCL Ltd, Intel, Grasim, Ultratech, Bosch Ltd, Lupin Foundation, JK Lakshmi, L&T Finance, Hindustan Zinc, Vedanta, ACC, PVR, Sterlite Tech, WNS Global, UPL Ltd, Cholamandalam, JK Tyre etc. In 2016, we received 75 applications from companies and foundations like HSBC, Intel, Renew Power, Tata Chemicals, Jubilant Foodworks, SRF Foundation, Dalmia Bharat, Essar Foundation, Cairn India, ITC, Lupin Foundation, DHFL, Biocon Foundation, Sterlite Technologies, Magma Fincorp, Jana Foundation, JSW, CRISIL Foundation, EdelGive Foundation, Aditya Birla Financial Services, ICRISAT etc. In 2017, we received 94 applications from organizations like ICICI Bank Ltd, Moody’s Analytics, Dell India, Shapoorji Pallonji Group, Hinduja Global Solutions, Essilor, Canon India, Dabur India, SBI Foundation, HCL Foundation, Hyundai Motors, Mphasis, Toyota, Mahindra & Mahindra, Grasim, GNFC, NSE, MetLife, Rio Tinto, WNS, Humana People to People, Smile Foundation, Apollo Tyres, Pernord Ricard etc. The applicant organization must be a company or CSR foundation/trust or an implementing partner (NGO/Tech partner) for CSR project and the project must have been supported by a company/CSR Foundation under its CSR initiative. The applicant entity must have legal status as company/NGO/Trust/LLP and be registered in India or have a subsidiary/alliance in India. Note: In case there are less than three entries in a category, the applications will be automatically evaluated under CSR Project of the Year 2017-18 category. The Jury has all the rights to evaluate applications in a category where the project fits best, even if the award application has been submitted in a different category. 1. Healthcare: Projects in healthcare, public health, preventive healthcare, use of technology in healthcare leading to better healthcare services or outcomes etc. 2. Education: Projects in education, special education, awareness building, education infrastructure etc..
3. Skill Development: Project in vocational skills and employability enhancement among children and youth etc. 4. Livelihoods: Project in areas of creating livelihoods opportunities, sustainable livelihoods, economic empowerment, market-linkages for community products, agriculture value-chain, SHGs capacity building etc. 5. Environment: This category covers projects in areas of energy, renewable energy, environmental sustainability, ecological balance sustainable transport, waste to energy, recycling, natural resource management, conservation, plantation etc. 6. WASH: Projects in line with water and sanitation, hygiene, Swachh Bharat Mission, behavioral change for use of sanitation and push for cleanliness in project/programme mode etc. 7. Women Empowerment: Promoting gender equality, Empowering women to participate fully in economic life across all sectors, setting up homes and hostels for women etc. 8. Rural Development and Infrastructure: A rural development and infrastructure project for better public facilities, better living conditions and improvement in terms of access, quality of life in rural area. For example, construction of road, bridge, community hall etc. 10. Employee Volunteering Initiative: As employee volunteering has been listed as one of the CSR project/intervention area as per the Companies Act 2013, it would be good to understand how companies are engaging their employees for volunteering with communities or for a cause. (Please note that there is a specific form for this category). 11. CSR Project of the Year 2017-18 Award: For an outstanding project that combines innovation with high impacts-delivery in any of the thematic areas. The applicant agency should be convinced that the project and its impact have merit to be recognized as ‘CSR Project of the Year 2017-18. There are few special categories of Awards that look at over-all organization/s engagement in projects or programs to maximize the impacts in relevant theme or overall impacts. These special awards look at how organizations have walked an extra mile to achieve visible and long-lasting impacts and how their efforts become a model for replication. 12. CSR Foundation of the Year 2017-18 (Only for CSR Foundations): The foundation set up by any company or consortium of companies either to manage CSR fund or to implement CSR projects can apply in this category. The broader evaluation parameters are how the foundation has successfully followed the CSR mandate of the company and how they have tried to deliver best possible impacts at the project or program level whether through direct implementation or through banking on the expertise of the other implementing partners. 13. Company with Best CSR Impacts in FY 2017-18(Only for companies): This category looks at the overall initiatives, impacts and sustainability of impacts through CSR. This is all about overall intend, efforts and impacts that an organization has made or have been making through its various CSR projects and programs. These initiatives can be stand alone project or through partnerships or association of more than one organizations’ collaborations. 14. CSR Implementing Agency of the Year 2017-18: This category caters to identifying two of the best CSR implementing agencies in India. 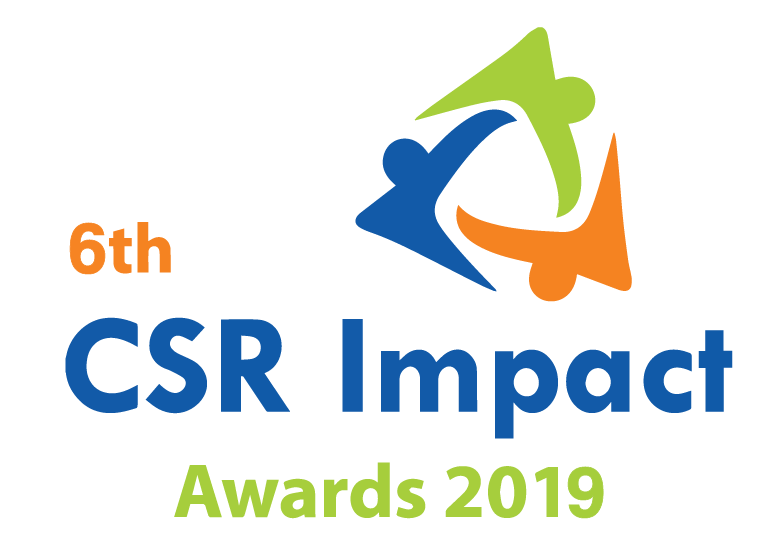 The award looks at CSR partnerships with companies/CSR foundations, CSR projects & programs, focused approach towards solution to development challenges, CSR impacts and scalability of the operations in future. a. Small Projects: Projects where FY 2017-18 CSR funding/budget was below INR 1.0 Cr. b. Large Projects: Projects where FY 2017-18 CSR funding/budget was INR 1.0 Cr. or above. In case of the category 10, there will be two awards based on the jury’s decision. Small: With annual budget equal or below INR 10Cr. Large: With annual budget above INR 10Cr. For the category 14, there will be two awards for implementing agency of the year; one for the small grass-root organization and the other for the relatively large organization, based on the Jury’s discretion. As the Awards aims to recognize project specific outcomes and impacts, both the funding agency and implementing agency get the due credit for the award. Showcase your organization’s innovation and commitment to deliver impacts in alignment with Government’s focus on water and sanitation, healthcare, education, livelihood, skills development etc. (Applications shortlisted after the screening round, will be intimated for the Jury round date and slot by 11th September 5.00pm and will be required to be available for the video conferencing or skype-interaction with the Jury on the given slot. This will be entirely based on the application form filled by the organization. The detailed application form has been divided into various sections. The stage-I screening will be done by a group of three different experts for each of the category. These three experts for each category evaluation will represent different organizations, with a mix of thematic expertise, project management expertise and business engagement acumen. After the screening round top 50% of the applications in each category will be processed for the Jury round, where the short-listed organizations’ representative will be presenting the project to the Jury via video-conferencing or skype call. A prior notice of the same will be given 3- days before the scheduled call/slot. The names of the Jury member for each of the category will be announced on the event website by 30th June 2018. Applications that reach to the Stage-II of the evaluation will receive a feedback from the Jury members to help the applicant organisations to improve on reporting on CSR projects. 1. The award is a voluntary initiative of NGOBOX (Renalysis Consultants Pvt Ltd) in association with a few like-minded organizations. The assessment process for the applications has been published in public and any individual or organization can’t challenge it. All applicants agree to this. 2. The applicant, by applying for the awards category, agrees with the decision and outcome of the process laid out in this document. 3. The application fee for the award is non-refundable and non-transferable. 4. If an application does not fit-well in the category applied for, the Evaluation Partner/Jury may consider it for other best-fit category. 5. Incomplete application form will not be accepted and application fee will not be refunded. 6. The organizers can ask for more information from applicants during the application assessment process. 7. If at any stage of the evaluation, the Award host organization comes to know that the information provided in the form is not correct or does not present the facts, then the application will be rejected. 8. Applications should be submitted in the given format only. 9. If due to insufficient numbers in a particular category of awards, entries are not adjudged, the fee will be refunded back to the applicants of that particular category. Creating a Natural Habitat- Environment for a Vulture Safe Zone.